I realized the other day that I haven’t shared any Halloween recipes this year yet. For some reason, I kept thinking we had a lot more time before Halloween. But surprise! It’s in two days! Whoops. This past weekend, I had a sudden hankering for candy corn. Those terribly addicting holiday treats that you just can’t stay away from. I wanted to make a simple dessert, and something food safe to pack in the kids school lunches. 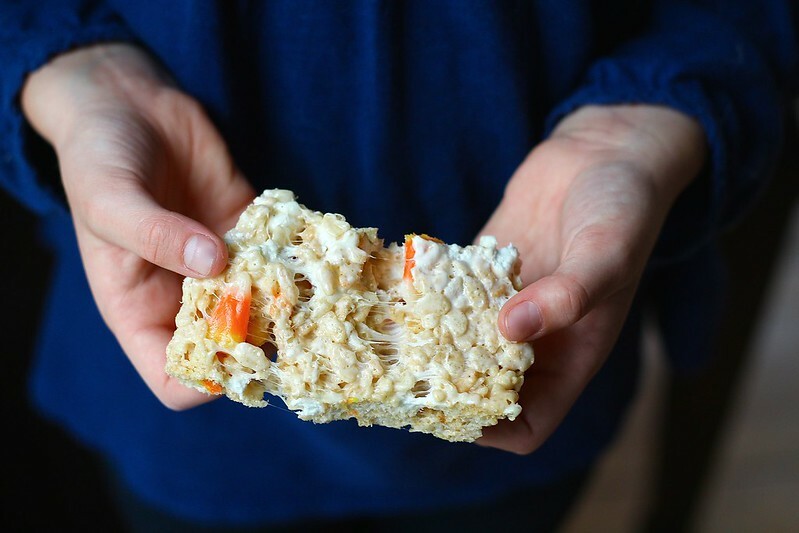 Insert these Rice Krispie treats. Because putting candy corn into the treats wasn’t enough, I decided that browning the butter would be an excellent addition as well. 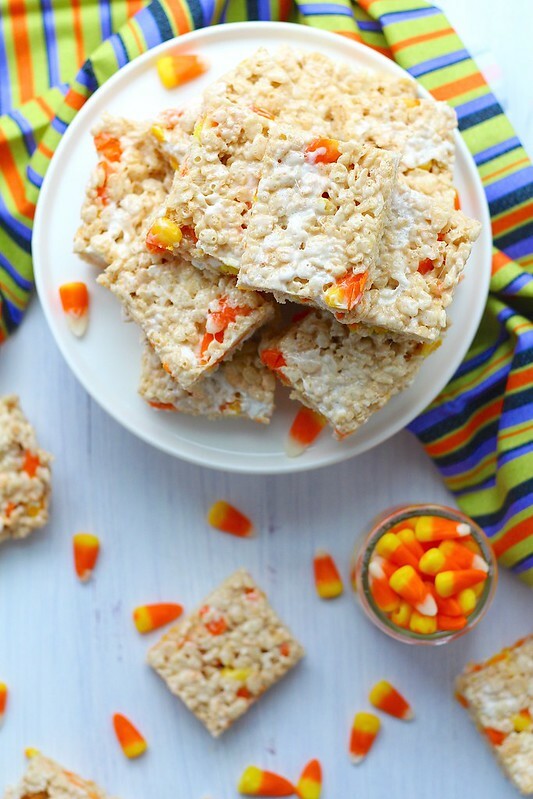 It creates another layer with a slight nuttiness to offset the sweetness from the candy corn and marshmallows. These treats are incredibly gooey, all with the help of extra marshmallows. These will please kids and adults alike. Everyone will want to go back for more. 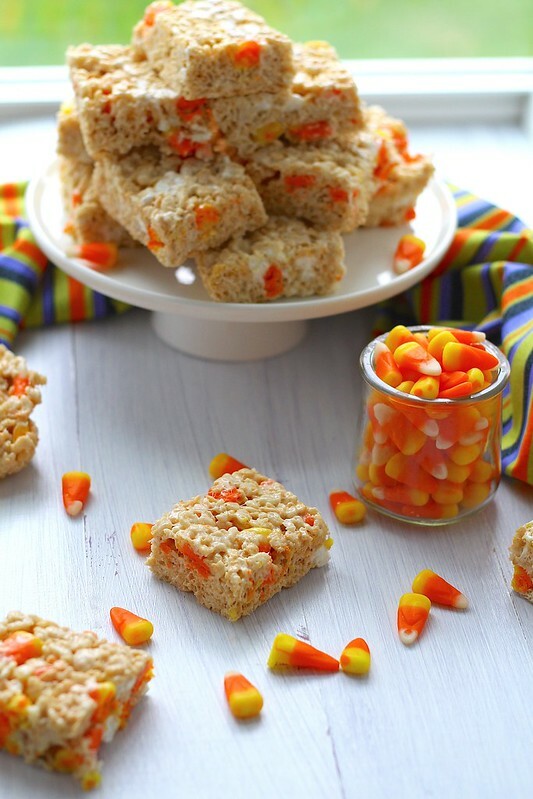 So, go make these for a Halloween party, or just to have in the house. These are super simple, super fast and super satisfying. And slightly addicting. Line a 9x13 inch pan with foil and spray lightly with cooking spray, set aside. In a large pot over low heat, melt the butter. Continue to cook the butter, swirling the pan occasionally until the butter is golden brown and nutty smelling. Once the butter has browned, stir in the 8 cups of mini marshmallows, stirring constantly until melted. 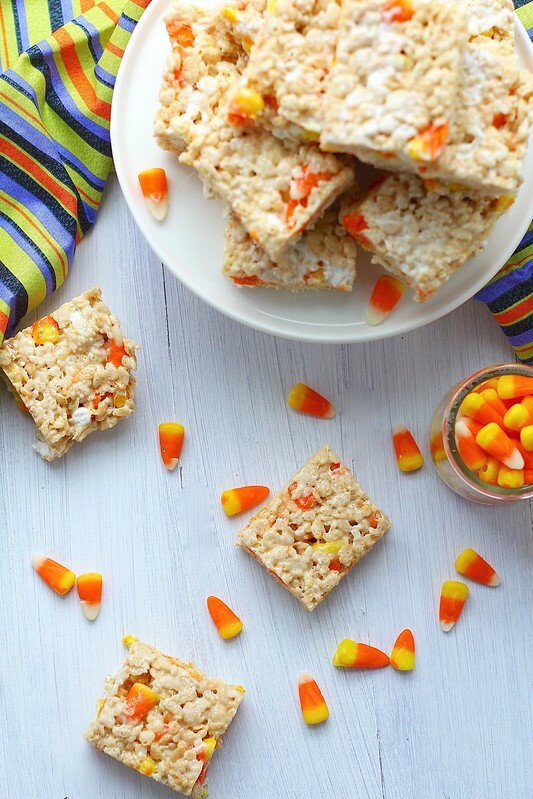 Once the marshmallows are melted, immediately remove from the heat and stir in the Rice Krispies and salt, and mix just until coated. Then stir in the remaining 2 cups of mini marshmallows and candy corn. Scrape the mixture into the prepared pan and press in evenly with the back of a spatula. Let cool completely before removing bars in foil and cutting into squares, about 2 hours. Serve, or store at room temperature in an air-tight container, up to 5 days.